Our November www.ServiceTrek.org just finished, and a very big thanks to Jangbu Sherpa, Marion Goodkind, John Simmonds, Kim Martyn Smith and everyone. You were so helpful in walking out to the remote villages to deliver supplies, teach in the schools, and to visit patients. 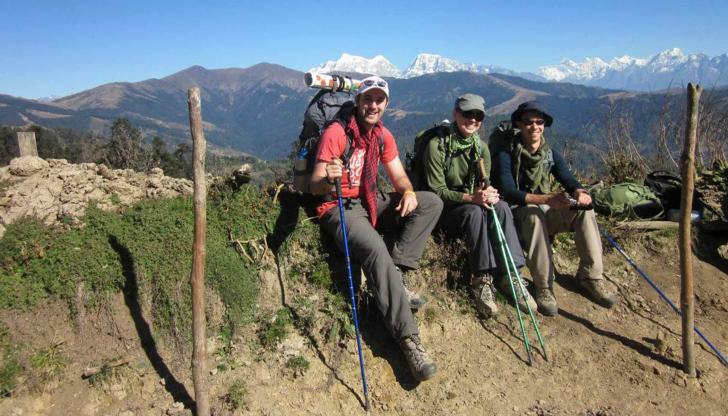 We would like to Welcome Everyone to Our Next www.ServiceTrek.org on 14 to 26 June with leader Dan Mazur. 24 Nov: ‎SERVICE‬ TREK: WE ARE LEAVING BEHIND ALL GOOD AND SAD MEMORIES. BUT LOTS OF HELP NEEDED 4 SCHOOLS, HEALTH CLINIC N COMMUNITY. GOING BACK TOMORROW. 22 Nov: HUMBLING EXPERIENCE @ MONASTARY. CHALLENGING CONDITION AFTER ‪‎EARTHQUAKE‬. STILL REBUILD NEEDED. AT THE END COMMUNITY DANCE. 20 Nov: CHARITY‬ WALK - GREAT WEATHER, ‪#‎EVEREST‬ VIEW ALL THE WAY TO JAFRE THEN FOREST WALK TO REACH PATLE. GREAT DAL BHAT FOLLOWED BY INTERESTING JEEP JOURNEY POOR YANGI! STUNNING ‪‎EVEREST‬ VIEW N SUN SET. Walking on foot hill of Everest. Site map of Tapding village. Students in the temporary tin class room. Om mane payme ho. Sleeping tents. Local way of getting milk from cow. Multi talent sherpa. Local kids. Damage school at maidanee at Patle village. Local family. Another damage house at Patle by Earthquake. Local kid. Local god for Patle. Coming back romote village. Member blessing. Damage school by Earthquake. One of the assistance teacher in Maidane school who got bite by Snake, due to lack of knowledge she stay one month in home without any medical treatment. When she went to Hospital it was too late. Members rotating player wheel. Teacher from Maidanee Schoo.. Temporary School of Dhaurakharka Schools. Members helping students and giving away some present. Sherpa Dance performance. Chhermading school class are taken in Tin class room due to damage of main buiding by earthquake. School student from Maidanee school after receiving gift from members. No Sign of building at Chhermading after earthquake. Final view of Everest before leaving remote village. Jeep is read to take us to Kathmandu. Fly to Phaplu Airport. Chigane village.